Tired of investing in expensive top quality content that merely yields lackluster marketing results? Like many marketers you’re probably wondering whether you picked the wrong content creator or amplified and promoted the content enough. But did you ever consider that the problem isn’t your content? Yes you heard me correctly. May be it isn’t your lovingly crafted content or your proven amplification and distribution process. Did you just stop in your tracks like a cartoon Road Runner? The problem is your audience. I’ll let that sink in. Regardless of whom you’re targeting and what you’re offering, your audience consists of real people. No matter how they use them, they’ve only got 24 hours in a day. As a result, your content is competing for seconds of their limited time and attention. Even worse, like you, every other marketer is trying every possible trick to nudge them to act. Of course, you can’t tell your boss your potential customers are lazy sniveling slugs who don’t give a damn about your award-worthy content. We both know how that argument will wind up and it’s not pretty! Starting to feel depressed that no matter how good your content is, it’ll never get the full attention it deserves. What if I told you that there was another way to present your content that would pull your prospects in and get them to engage? You can transform your static, unloved content into interactive content. Then it’ll tap into the full power of tailored digital experiences to yield measurable business results. As content marketing matures and evolves, astute marketers must grapple with 3 key challenges. While the bar for useful information that meets audience needs keeps going up, marketers no longer compete with just their head-to-head competitors and massive leaders (including Google, Facebook, Apple and Amazon). They also compete with everything demanding their audience’s attention including family and friends, their job and personal time. Dazzled by vanity metrics and easy-to-track results, marketers are limited in their ability to offer truly targeted, personalized content based on small data. Marketers need the power of intelligent content combined with AI tools to deliver a personalized customer experience. In part, this is attributable to the Marketing and Sales disconnect that exists in many corporations. Yes Marcus Sheridan makes compelling arguments for making your departments work together but that’s not enough to tear down this deep departmental divide. It’s often exacerbated by conflicting goals. Even with the best intentions, many companies fail to create effective (read: profitable revenues) follow-through. One-size-fits-all answers fail to convert most initial respondents. This means you need tailored response based on reader interaction. This isn’t new. Direct marketers have known this for years. Interactive content is a browser-based digital experience that entices prospects to engage with your information. Interactive content is grounded in traditional direct marketing that broke through the promotional clutter to persuade recipients to do something. Early direct marketing examples of offline interactive content include contests, stickers and checklists. The objective was to get recipients to act—even if it was only to apply a “Yes” sticker to a response card. Interactive content yields customizable customer experiences. They can be integrated into freshly created content or embedded into repurposed existing content. The key to success is providing tailored post-engagement content. Deliver tailored marketing messages that build on past messages. Determine key customer moments of truth where interactive content will have maximum impact. Offer a consistent experience with a unified voice across your customer-facing departments. Interactive content requires digital functionality and available bandwidth. To put this in perspective, video content and advertising, while easy-to-create for major advertisers, didn’t gain traction until 2004 to 2006 because bandwidth was limited and expensive for both businesses and users. Initially video was considered interactive compared to other content formats since viewers spent time adjusting the controls such as sound and replay. The main actor in early videos pointed to the call-to-action button adjacent to the video player. The first interactive content hit was Live Vault’s Back Up Trauma Video staring John Cleese promoting the company’s system backup solutions. The video garnered 150,000+ downloads and 200+ links in the first month. This was a record-breaking number of downloads at the time. This content was interactive because Cleese steps out of character at the end to directly address the viewer. He instructs him to answer a question by clicking one of two buttons. The viewer sees tailored video based on his answer. 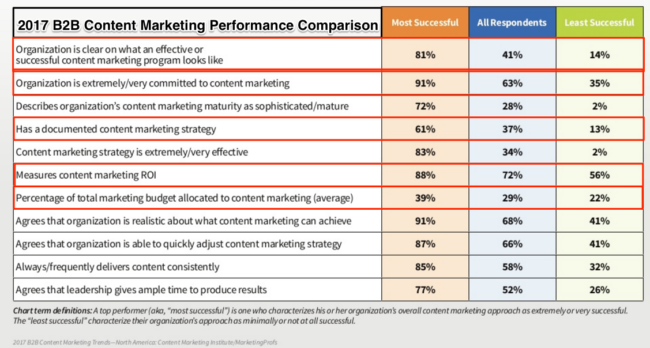 Make the case to your boss for adding interactive content to your content marketing strategy, use this data from Content Marketing Institute and Demand Metrics. 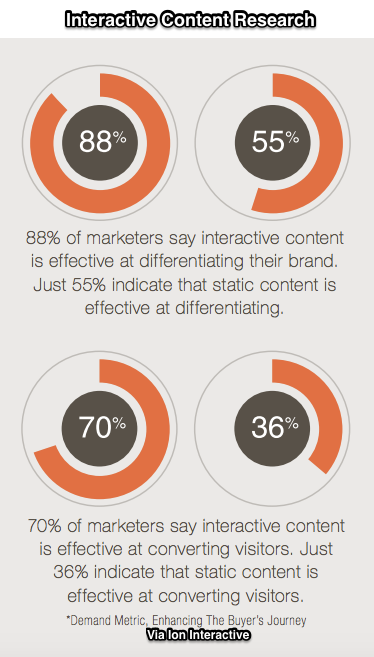 Marketers consistently found interactive content achieved their objectives. Interactive content worked across the buyer journey. 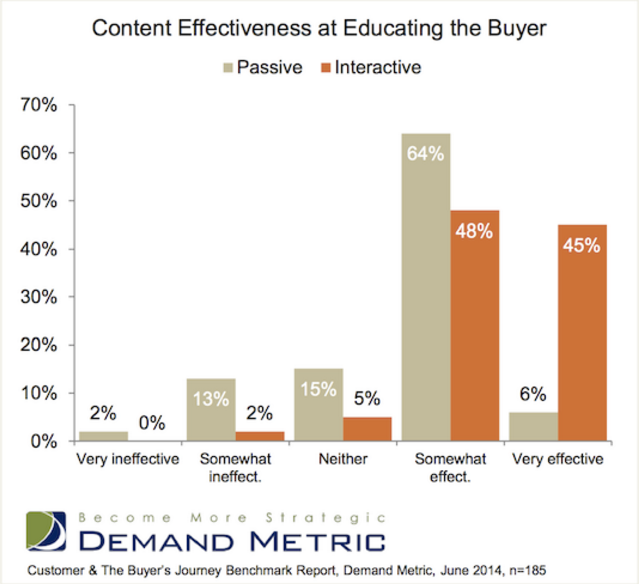 93% of marketers thought that interactive content was either somewhat or very effective at educating buyers over passive content according to Demand Metrics research (2014). Interactive content is almost twice as effective at converting prospects as static content according to Demand Metric Research. Interactive content enables marketers to overcome the 3 content marketing challenges outlined above without investing in totally new content, hires (including freelancers) and technology. By tapping into the interactive functionality embedded in digital marketing, interactive content breaks though the drab array of passive, static content. It pulls prospects into the content. Even better, audience actions go beyond adjusting viewing preferences and downloading content. It requires reader input to work. User actions leave footprints that translate to useful information. Based on this feedback, marketers can offer more tailored content prospects actively seek. Further, this follow up content doesn’t involve time delays that many calls-to-action do while user input is checked. As a result, businesses appear more responsive to prospect needs. This data enables marketers to provide richer, relevant information that helps prospects and purchase influencers to make their decision. In the process, marketers build credibility and trust for their business. Armed with relevant post-interactive content engagement, prospects can continue to gather the information they need to purchase from your business. Done well, this content taps into companywide expertise that prospects trust such as explanations from technical experts and how-to content. Further, this post-interaction content makes your business appear responsive in real time until qualified sales people can enter the process to close the deal. 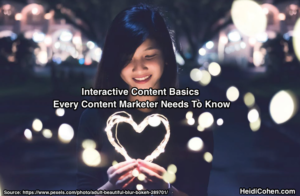 While interactive content can improve content marketing conversion rates and provide more tailored content that prospects expect, interactive content isn’t a plug-and-play asset that works miracles on a weak content marketing strategy. 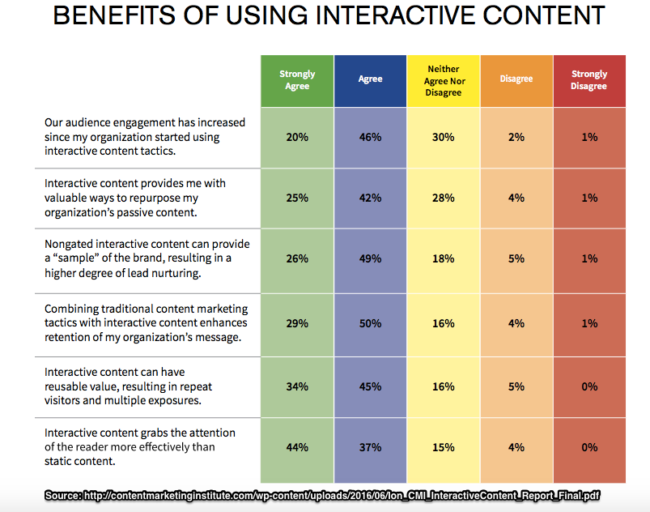 Interactive content is a relatively new form of content marketing. As a result, there’s limited information, case studies and training. Early-to-market suppliers created most existing materials so they feel like advertorials. This diminishes their authority and effectiveness. Marketers must understand the full implications of using interactive content across different media types (owned, social and paid) without feeling they’re being sold to. Just inserting a piece of interactive content into a few pieces of existing content or social media like it’s a piece of expensive jewelry won’t cut it. By itself, this approach will fail to improve bottom line results. Interactive content must be incorporated into your overall content strategy to yield maximum results. BTW, don’t forget to make your content actionable. Track and utilize the small data that your interactive content produces to generate a tailored experience for prospects including post-engagement content. This is key to keeping prospects in your purchase funnel and guiding them forward on their journey. Without this, your user engagement may not translate into buyers. Interactive content has distinct attributes that smart content marketers will leverage to their advantage. 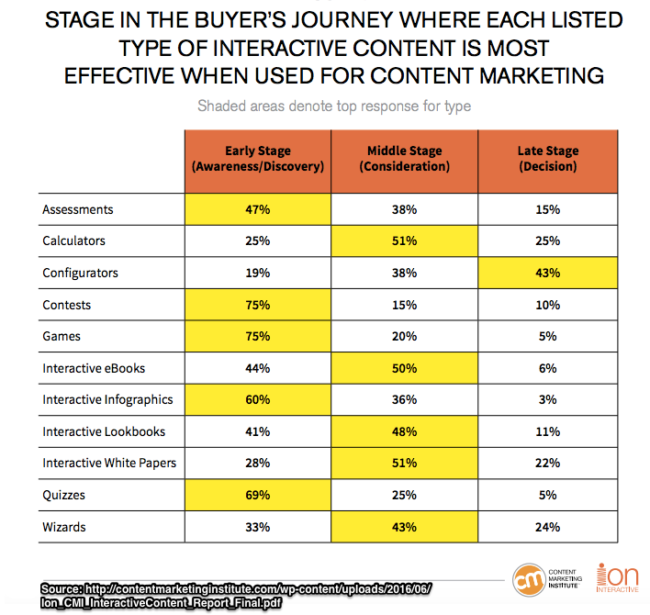 Here are 10 key interactive content attributes. Offers a wide array of different interactive content formats. Includes interactive white papers, microsites and infographics, quizzes, assessments, graders, calculators, polls, surveys, voting, photo galleries, contests, trivia, brackets and games. Breaks through content shock. While plain text is challenged to compete with sexier video and other bright shiny content offerings, interactive content competes to attract attention. Supports different stages of the buyer journey. Target interactive content to key moments of truth to maximize results. Integrates with existing content to minimize content costs. Includes supporting content and distribution. Creates immersive experiences that yield higher engagement than static content. Even yawn-worthy B2B content can be made easy and enjoyable to consume. Can be placed on owned, social and third party media. Depending on the media entity, you may prefer to use another piece of content to direct readers to your interactive information. Requires tailored post-engagement follow up. To maintain your connection with your prospect, target your future communications based on content interaction. Keeps prospects engaged between their initial interaction and sales. Offer a continuous series of content including additional interactive content where appropriate. Provides trackable, actionable content consumption analytics. As a result, you get higher conversion rates and understand your prospects better. Requires on-going testing to yield optimal results. Like any piece of content, test every element of your offering starting with the areas that have the biggest impact on results. Like interactive content, there’s static content whose objective is to attractive attention and rouse readers from their passive inactivity. User contact information may be collected. While this is a good first step, it’s often insufficient to personalize content through the customer journey. User content consumption is often unknown. GIFs. Provide interactivity to attract attention but they don’t require reader action. Video and/or audio. Attracts attention. Involves interaction with a media player. Incorporate a call-to-action for customer next steps and tag it in your analytics to track results. Visuals and infographics. Can create action if scrolling or enlargement is needed. Add this content to attract attention since people are visual beings. Additionally, infographics can drive backlinks. Games. Work well to engage your audience. Unless you’ve created a specific game for your content, it works like advertising to build brand recognition. Downloads. Often require a form to capture email addresses and other information. Even an email reminder for the content download doesn’t ensure the content will be read. Webinars. Provide a teaching experience. But registrations don’t necessarily translate to content consumption. They’re useful to build your email list. Buttons and forms. Are good calls-to-action whose goal is to accomplish a specific act leading towards conversion. The delivered content isn’t tailored. Embedded social shares. Add a visual component to your text for visual learners. Hyperlinks. Are subtle calls-to-action to reference additional content or sources. They aid scanning in an article’s Table of Contents or extend time-on-site with Recommended Reading. Chat. Is useful to answer prospect questions in a timely manner. This functionality is external to your content. Learn the interactive content basics to have a secret weapon to combat content shock and other attention-grabbing objects. Start to integrate interactive content into your content strategy to get a jump on your content competitors. This will allow you to take advantage of the higher performing, new content options before the results are diluted by follow-the-leader marketers. Don’t think you know enough about the interactive content basics to try it? I get it. I’ve been in your shoes. But the only way to succeed at interactive content is to test and improve your results. You don’t want to wait so long that you miss the opportunity to capture maximum results. Even better, early adopters get the added benefit of becoming a state of the art example. Start small by repurposing a piece of existing content. For example, transform a checklist into an assessment. You’ve already done the hard work creating the content. Try it—you’ll learn how to create successful interactive content. What’s your favorite example of interactive content and why do you think it succeeds? Tags Content Marketing Institute, Demand Metric, Interactive Content, John Cleese, Marcus Sheridan. Bookmark the permalink. To me, this is an eye opener….. I have some excellent content yet little interaction with visitors. I will attempt to incorporate some of these ideas as days apss.